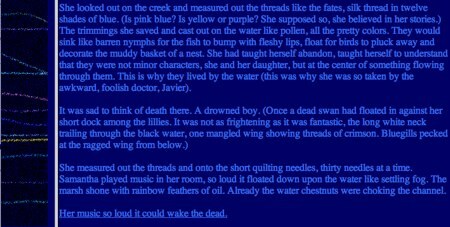 I do love the audio visual narratives that play up the graphics and motion over story, but isn’t there a place for digital text as the main vehicle of narrative? 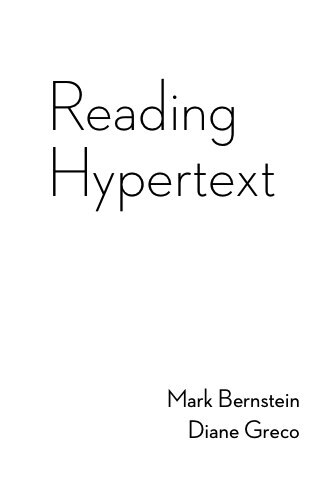 It seems that hypertext as a way of storytelling, without the added pizazz of preferably moving visuals and audio that to me at least sounds annoying when repetitiously run throughout the piece, is either a dinosaur or needs the help of much more than color and background images. And yes, sentences that sing no long mean eloquent writing. We as digital consumers are indeed very concerned with glitz and glamor, but does that necessarily mean that we can’t do text-based narratives anymore? I don’t think it does. Then again, audio visuals distract us from the anxiety of making choices and closing doors. Do we really want branching narratives? Moreover, do we want those choices to be so conspicuous? There is much to think about indeed.